Dorn Mill in McCormick was built as a cottonseed mill in 1898 and converted into a flour and gristmill in the 1920s. It operated continuously until the 1940s. After the invention of the cotton gin in 1793, “King Cotton” became increasingly important to the economy of the South. The spread of railroads enabled farmers to reach wider markets and the textile industry thrived. Cottonseed was a by-product of the ginning process and used primarily for animal feed. When the boll weevil caused the rapid decline of cotton in the 1920s, Dorn Mill retooled with modern steam engines and boilers and converted to a mill that processed wheat and other grains. Primary products were ground corn meal for sale in local stores, chicken and animal feed, and flour for local farmers’ home use. The boilers were powered by sawdust and wood chips from a nearby lumber yard that was also owned by the Dorn family. Only two people were needed to run the mill. One person fired the boilers and operated the machinery and the second person waited on customers. 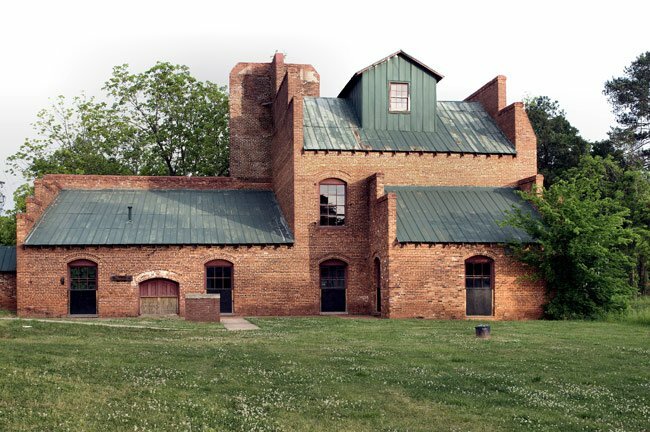 Dorn’s Flour and Grist Mills is a two-and-a-half story red brick structure with projecting one-story wings. Constructed ca. 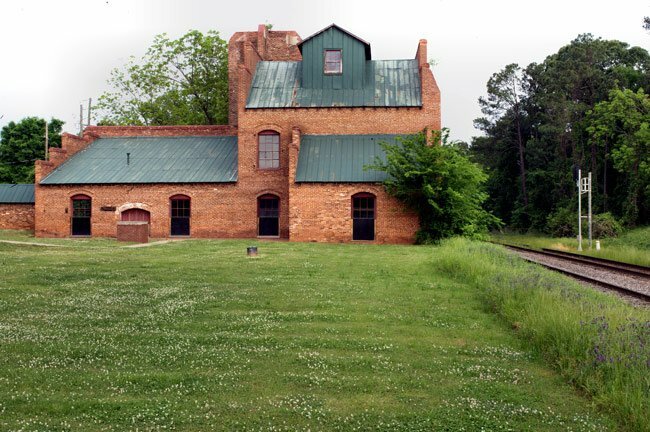 1898 as a cotton gin, the mill is an outstanding example of rural industrial architecture. The dominant feature of the exterior is a three-story brick wall of cross-shaped plan which was built in 1915 to support a water tower tank. The interior of the mill is its most salient feature. The extant steam engines and boilers date from the period when the building was used as a cotton gin, but the grist mill equipment dates from the 1920s. At one time many small towns throughout rural America utilized the services of mills similar to Dorn’s Mill. With the development of a more complex mill technology, many of these mills disappeared. 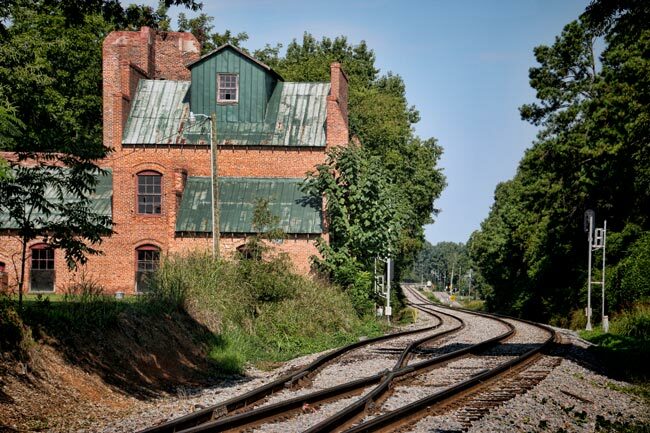 Dorn’s Mill is significant as one of only a few such mills still standing—its steam engines, boilers, and most of its machinery still intact. In 1917, the property was conveyed to M.G. Dorn, J.S. Dorn, and Preston Findley who formed the Dorn-Findley Corporation. Its general purpose was to run an oil mill, cotton gin and grist mill. In the mid-1920s the Dorns hired a mill wright to put in the present corn and wheat machinery as well as a hammer mill. The mill operated throughout the years and ground commercial corn meal for sale in local and country stores, flour from wheat for local farmers (not for commercial sale) and chicken and animal feed. The mill closed in the 1940s. Welcome to South Carolina, Kimberley! Anyone is allowed to go up to the mill, it is right off of Main Street in McCormick, near the Post Office. To go inside, you do have to contact people in charge of the property. According to their website, you can reach out to Marian Parnell at 864-852-2418 or Barbara Hinkel at 864-391-8355, these two are in charge of renting the building out. You may be able to give a quick call and just explain that you’d be interested in viewing the structure to see if they ever allowed something like that. Hope this helps and if you take any photos, we would love to see them. Happy exploring! I am new to South Carolina, and I love to learn about the history of small towns. I was wondering if you can go up to the old mill and if anyone is allowed to go inside? I have yet to go inside of a historic land marker and would love to learn more about these small towns in South Carolina, thank you. What is this building’s current use?